LAVA co-founder Richard Schave invites you to join him, Nathan Marsak, Gordon Pattison, and other special guests for the latest free walking tour in the series Broadway On My Mind. Join us for a walk around Temple and Broadway to the sites of the historic jails of old Los Angeles. You’ll learn about the places where criminals were housed, judged and sometimes autopsied, from the earliest Yankee-era adobe cells to the grand 1924 Hall of Justice (“HOJ“). The tour reveals a giant nexus of law enforcement, encompassing U.S. Attorneys, District Attorneys, the Office of the Sheriff, the county’s central jail, County Supervisors, the Office of Coroner, and more. The history of these lost buildings will be punctuated with historic accounts of mayhem, lynchings, and other sordid tales of woe. We’ll also discuss the 1990s closure of the HOJ and the long process of its restoration. 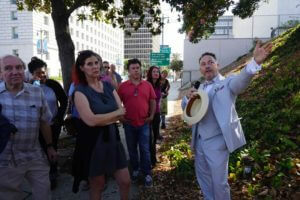 If the criminal and civic history of Old Los Angeles intrigues, don’t miss this tour. Tour attendees will gather in the basement of Grand Central Market following the LAVA Sunday Salon,. We’ll begin with a brief slide show, We’ll begin with a brief slide show, then set out to explore lost and surviving tunnels along Hill Street & Broadway.